While most tile roofs use rake tiles to finish the rake and gable ends, Boral Roofing also offers an alternative look for traditional slate and shake style tile roofs. They also protect against weather, vermin and debris accumulation while integrating seamlessly with the overall appearance of the installation. 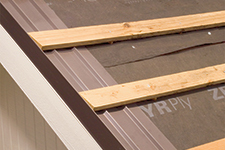 Gable End Rubber Wedge Closures from Boral Roofing fill the spaces between overlapping tiles at the gable ends of the roof system to protect against the elements and deliver a traditional wood shake look. Metal Rake Trim from Boral Roofing is an easy to install, finished rake trim that helps prevent anything from getting under the roof system.